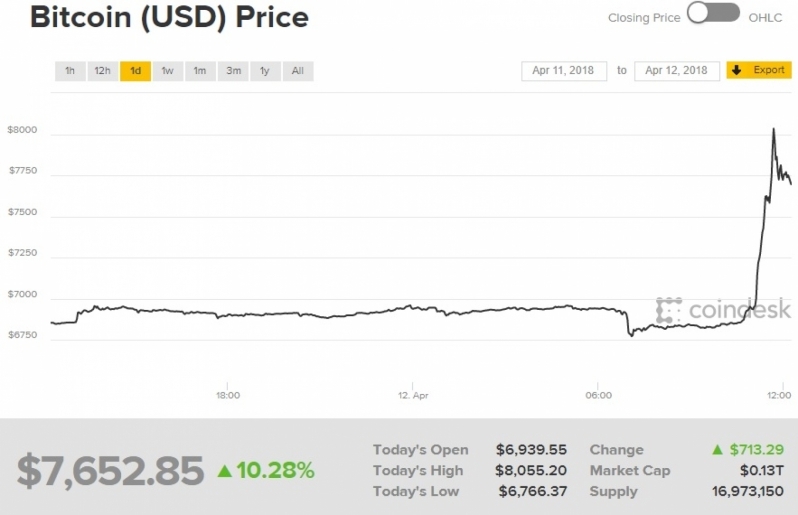 Bitcoin is now trading at over $7,700. Read more about Bitcoin's surprise surge in value. It increases because forecast weather report announced rain in Washington DC. If you examine the spikes in bitcoin price in the past, they usually follow some sort of financial crisis, when fiscal measures were placed on Greece restricting the locals ability to access money bitcoin use spiked and so did the price. Hyperinflation in Venezuala had the same effect. That was of course before the speculation pushed rises last year, which have now mostly evaporated. But now its a classic one, risk of war that could destabilize the oil markets among others and the price begins to lurch upwards again. When Bitcoin is relatively stable, its fairly good short term asset store. I suspect that what is going on.